We are right smack in the middle of blood orange season and I couldn't be happier about it! If you have been to a grocery store lately, then you have probably the slightly discolored oranges that are sitting next to the normal oranges. You may even think that the grocery store is trying to sell you some bad oranges. But's it what's on the inside that counts, guys! And that beautiful blood orange pulp and juice is what's on the inside. While blood oranges definitely look a little bit different than normal oranges when you slice them open, they taste very similar. Blood oranges, to me, are a bit more tart (which I love) which makes them great for baking! You can replace blood oranges in any recipe you would normally find a citrus fruit, like lemon or orange (duh!). Which is why I decided to use this batch of blood oranges to dress up one of my favorite desserts: the pound cake! 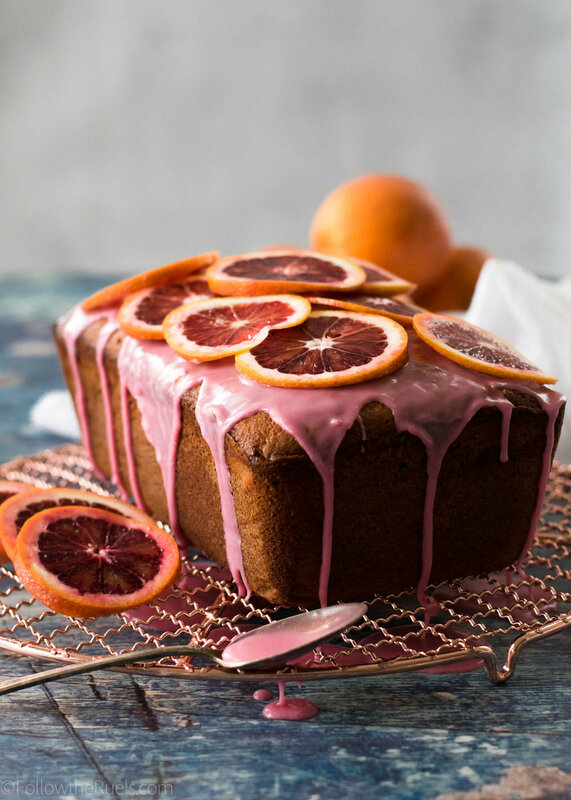 This blood orange pound cake may look a bit fancy, but it's really just your typical pound cake with a few extra accessories. Of course, there is blood orange juice and zest in the batter itself, but it is also topped with a blood orange glaze. Since I love almonds and citrus fruit together, this pound cake is also made with almond meal and almond extract. The almond meal does make the cake a bit denser, but it also makes it super moist! The first thing to do is juice and zest a couple blood oranges. If you have a juicer, please use that otherwise you will end up with blood (orange juice) all over your hands. It's not attractive. But it is delicious! Mix the blood orange juice with some milk which will be added to the batter towards the end. Next, cream together the butter and the sugar. Since this is pound cake and not half-pound cake or quarter-pound cake that means you are creaming a POUND of butter. I don't trust any other pound cake recipe that doesn't use a pound of butter because then it just isn't pound cake! One thing to note is that there isn't any leavening agent (baking soda, baking powder) in this batter so the main source of leavening is the butter. More specifically, the air that is beaten into the butter. Really whip up this butter so it's nice and fluffy in order to have a little bit lighter of a cake. I mean, it's not going to be THAT light...it is a pound cake, after all. Or two, if you are impatient like me. 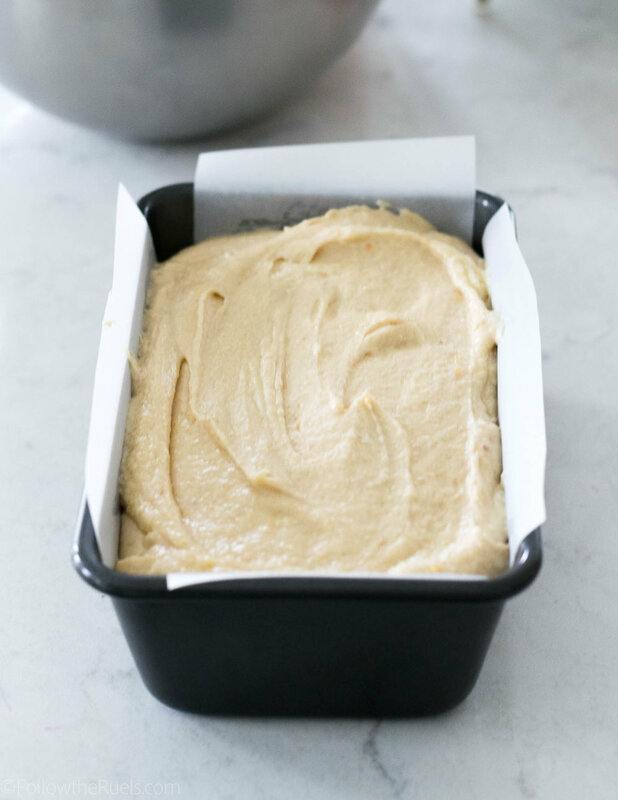 Then, like any other cake, you are going to alternating mixing in the dry ingredients with the wet ingredients, starting and ending with the dry. Lastly, pour the batter into a prepared loaf pan or bunt pan. I prepare my loaf pans by spraying them with a little baking spray then lining them with parchment paper, as you see above. For bunt pans, spray the inside with baking spray, then sprinkle flour all along the inside making sure to get all the nooks and crannies. Then just tap out any excess flour. Pound cakes do take quite a while to bake. So once you pop it in the oven you have a little over an hour to do whatever you want: clean the kitchen, read a book, mindlessly watching Insta Stories...whatever! Once out of the oven the pound cake will smell like heaven! Is there anything better then the smell of something sweet baking? Now combine that with the delicious smell of oranges. And that is the smell that will be filling your kitchen! You can't just leave this almond blood orange pound cake all nekkid. It needs a little something extra so people know that this isn't just your average pound cake. 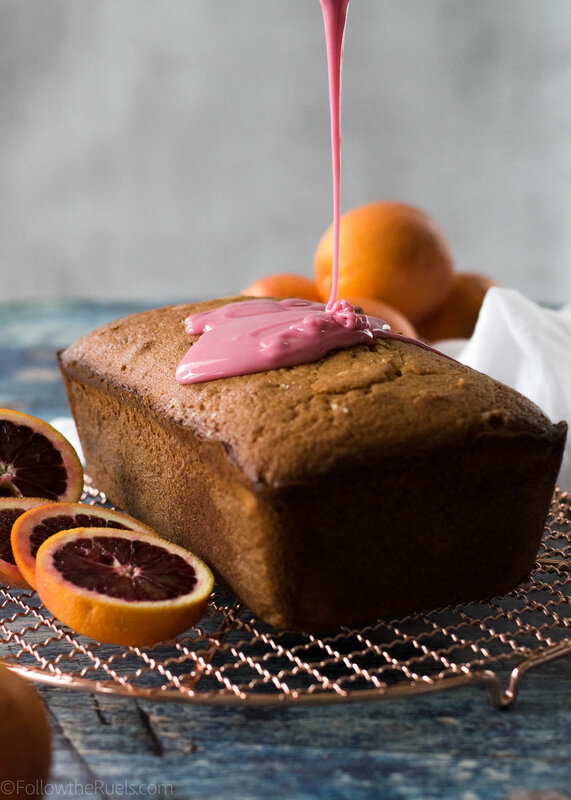 It's a blood orange pound cake! The glaze on top is very simple to make: mix the juice of one blood orange with 1 1/2 cup of powdered sugar. If it's too thick, add a couple drops of water at a time until its thin enough to run off the back of a spoon. Then pour that glaze all over the top of your blood orange pound cake. If you really want to get fancy, then you can add some sliced blood oranges on top. But I really only did that for the pictures. Or just immediately slice right into that cake and take a bite! Cream together butter and sugar until very light and fluffy, about 2 minutes. Mix in eggs one at a time until just combined. In a large bowl, combine the all purpose flour, almond flour, and salt. In a small measuring cup combine the blood orange juice, milk, zest and extract. If the top of the cake starts to brown before the inside of the cake is done, cover with a piece of aluminum foil.